Breast density is a frequent topic on social media, in the news and within medical literature – and your patients may be asking you about it. Dense breast tissue may obscure cancers on a mammogram and recent research indicates it is the leading common risk factor for development of breast cancer1. 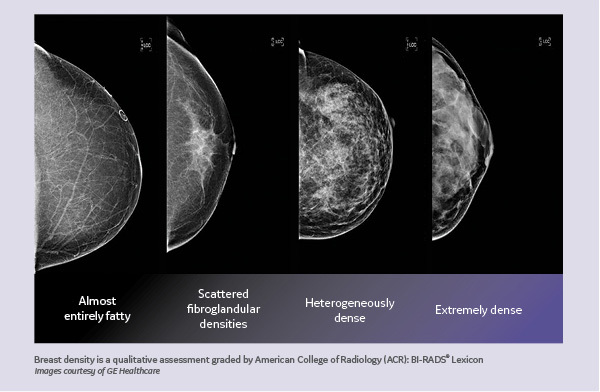 This educational article will expound on breast density’s clinical and radiological challenges, current research, tools and strategies for managing patients with dense breasts, as well as complying with breast density notification laws. As Chief Scientific Advisor for DenseBreast-info.org, a medically-sourced, educational resource providing breast density information to both patients and health care professionals, Wendie Berg, MD, PhD, FACR, Professor of Radiology, University of Pittsburgh School of Medicine, has both professional and personal experience on the topic of dense breasts. Dr. Berg is a radiologist, researcher and breast cancer survivor who has dense breasts. Dr. Berg also authored a “Readers React” response to the recent Contemporary OB/GYN article “Breast density laws: Are you in compliance?” Her responses underscore the benefits of supplemental imaging and answer many common concerns OB/GYNs cited about supplemental breast screening. Screening mammography is the only imaging modality that has been studied in long-term randomized trials, and it is proven to decrease mortality from breast cancer; however, mammography does not perform as well in women with dense breasts. More than 70 percent of breast cancers occur in women with dense breasts2, and research has shown that nearly one in two cancers is missed on standard mammography in extremely dense breasts3. In the United States, approximately 40% of women of recommended age for mammography screening have dense breasts, including over half of women in their 40s and a third of women over the age of 504. In women with dense breasts, cancer is more likely to be found because of a lump or other symptoms in the interval between routine mammography screens (termed “interval cancer”) and interval cancers tend to have worse prognoses. Because of the limitations of screening mammography, there is interest in adding ultrasound, MRI or other breast imaging to improve screening outcomes by improving detection of early invasive cancers and decreasing interval cancer rates. The issue of mammographic breast density is well known within the radiology community though little has been published about it in OB/GYN and primary care literature. Breast density refers to the composition of the breasts and is described as one of four BI-RADS® categories in the mammogram report, ranging from fatty to extremely dense, with “heterogeneously dense” and “extremely dense” breasts considered “dense”. The denser the breast tissue, the greater the risk of masking cancer detection on mammography5. There are also a number of studies that confirm that elevated breast density is an independent risk factor for developing breast cancer6. There are a number of supplemental screening options for women with dense breasts. Following is a brief summary of the most widely available supplemental screening modalities. • MRI: Based on multiple prospective studies, supplemental screening with magnetic resonance imaging (MRI) is recommended for women at high risk for breast cancer, regardless of breast density (>20% lifetime risk) beginning at age 25-307. In high-risk women, adding MRI can increase cancer detection by an average of at least 10 cancers per 1000 women screened each year compared to the 3-5 per 1000 found with mammography alone. An analysis of large studies of MRI showed low rates of interval cancers of 10% or less even among high-risk women when screened with MRI in addition to mammography8. However, MRI is limited by high cost, the need for contrast injection, and claustrophobia. • Ultrasound: Results from trials involving more than 100,000 women with dense breasts using supplemental screening ultrasound show added detection of 3-4 cancers per 1000 women screened, with such results maintained each year in the ACRIN 6666 study9. Importantly, more than 85% of cancers missed by mammography but detected by screening ultrasound are node-negative invasive cancers10. While most studies use handheld ultrasound performed by a physician or technologist, a large transducer approach can also be used. 3D automated breast ultrasound (ABUS) also is proven to increase cancer detection by about 2 per 100011. Screening with hand-held or automated ultrasound has the potential to increase false positive rates. • Tomosynthesis: Sometimes referred to as 3D mammography, digital breast tomosynthesis improves cancer detection over standard mammography (on average, 1-2 more cancers per 1000 women screened) but this benefit does not appear to extend to women with extremely dense breasts12. Tomosynthesis also has been shown to reduce false-positive callbacks. In many facilities, tomosynthesis may eventually replace standard mammography screening. 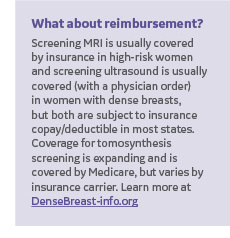 For more detailed information, visit the DenseBreast-info Technology section. Q. What do referring physicians need to know about breast density and supplemental screening? A. Clinicians need to know that breast density is the number one reason for missed cancer in screening mammography and that the risk of cancer is also increased with greater breast density. There is a growing body of research demonstrating that supplemental screening can increase cancer detection in women with dense breasts. Ultimately, our shared goal with patients is to decrease the number of cancers diagnosed in a later stage. Q. What role do you believe referring physicians should play in a woman’s breast care? A. OB/GYNs play a primary role in supplying women with the medical information that they need to make decisions about their health based on that woman’s individual values. They have to address a number of complicated issues and don’t have a lot time with each patient. When it comes to breast health, the priority is to do a risk assessment and have a discussion about what her values are in terms of how she wants to pursue her health. Guidelines are fine, but every woman is different and I believe this is more about personalized care than population health. Q. What information should referring physicians share with patients about breast density? A. It is important to tell patients who have dense breasts that although we recommend they have a mammogram, in a patient’s particular situation, a standard mammogram may not be enough. Clinicians should also review the pros and cons of supplemental screening. For example, we can add a test that improves detection, such as ultrasound or 3D automated breast ultrasound, which can increase cancer detection by over 50% when used as an adjunct to mammography, but it may also come with increased callbacks, biopsies and follow up. With a more complete picture, women can make better decisions. Q. How do you address the risk of missing cancer versus the increased risk of false positives with referring physicians? A. If you look at screening guidelines from various medical societies, the differences are not about outcomes – they all agree that beginning screening at age 40 produces the greatest cancer detection. The differences have to do with what emphasis the organizations place on the potential downsides of screening, such as callbacks, anxiety, or inconvenience. I don’t believe that it’s for the medical society to make this decision – they don’t know what’s important to that specific patient: one woman may be perfectly happy to accept callbacks and biopsies to improve the chance that if she does develop breast cancer, it will be diagnosed early. Another woman may prefer to be less aggressive and not do as much screening – and that’s okay, as long as she understands the pros and cons. Q. Why don’t we just screen every woman with tomosynthesis and leave it at that? A. Tomosynthesis is helpful and performs well in screening most women. However, the data shows that it does not significantly increase cancer detection in extremely dense breasts – these women will need additional imaging. Women with heterogeneously dense breasts who are screened with tomosynthesis, should understand that while it does provide some increase in detection, there may be cancers that will not be detected and they may want to consider supplemental screening. Q. What are reliable resources for referring physicians to learn about breast density and screening? A. To start with, there was a great article in the Annals of Surgical Oncology by Dr. Throckmorton, called “Dense Breasts: What Do Our Patients Need to Be Told and Why?”18 As a member of the medical advisory board for DenseBreast-info.org, I believe this is a terrific resource for patients and providers alike – the FAQs are very helpful. • Preliminary results from the first prospective trial comparing tomosynthesis and ultrasound with mammography-negative women with dense breasts, the “Adjunct Screening With Tomosynthesis or Ultrasound in Women With Mammography-Negative Dense Breasts” (ASTOUND) Trial, were published in the Journal of Clinical Oncology13. The purpose of the study was to evaluate the incremental breast cancer detection by tomosynthesis and ultrasound within the same participants. The tests found an additional 24 breast cancers with all but one being invasive cancers. Twelve were detected by both tomosynthesis and ultrasound, one was detected only by tomosynthesis and 11 only by ultrasound. The results translate to 4 additional breast cancers per 1,000 women screened detected by tomosynthesis and 7 additional breast cancers per 1,000 women screened detected by ultrasound with no statistical difference in the additional false positive recall rate between tomosynthesis and ultrasound13. • The SomoInsight study involved more than 15,000 patients at 11 sites. Results of the study, “Assessing Improvement in Detection of Breast Cancer with Three-Dimensional Automated Breast Ultrasound in Women with Dense Breast Tissue: The SomoInsight Study,” were published in Radiology14. The combined imaging approach of screening mammography and 3D ABUS generated a total yield of 7.3 cancers per 1,000 women screened, compared with 5.4 cancers per 1,000 for screening mammography alone. Nearly all of the cancers detected using ABUS were clinically important cancers (invasive cancers), with a 55% relative increase in invasive cancer detection over mammography alone. • The EASY Study, published in the European Journal of Radiology15, enrolled 1675 asymptomatic women with heterogeneously dense or extremely dense breast tissue. The combined read of digital mammography and ABUS detected a total of 6.6 cancers per 1000 women screened compared with 4.2 cancers per 1000 women screened with mammography alone. The difference in yield was an additional 2.4 detected cancers per 1000 women; a relative increase of 57%. The goal of any screening program is to find cancers early and reduce false positives. As evidenced by the limitations of mammography in dense breasts, one size screening does not fit all. There is clearly a need for customizing breast screening based on a woman’s individual risk factors including breast density, according to Monica Saini, MD, CMO of Institute of Women’s Imaging and Medical Director for ABUS at GE Healthcare. “For a woman’s breast care, clinicians need to factor their patient’s cancer risk and breast density in determining the most appropriate screening regimen,” added Dr. Saini. To avoid delay in diagnosis, it is ideal for the OB/GYN and radiologist to work together to manage each patient’s breast care. Risk assessment, to include a detailed family history of breast and ovarian cancer, age at diagnosis, breast biopsy history, menstrual history, body mass index and breast density, is the first step in determining the appropriate screening. Despite being recognized as a major independent common risk factor for cancer16, breast density has only recently been incorporated into a major breast cancer risk model – the Tyrer-Cuzick Breast Cancer Risk Assessment Tool now accepts automated breast density percentages generated by the VolparaDensity® software from Volpara Solutions or visual breast density. As the first widely recognized risk model to include family history, genetic factors and breast density, the Tyrer-Cuzick Tool informs doctors of a woman’s risk of developing breast cancer to help them make decisions about genetic testing and supplemental screening. According to Dr. Saini, personalized screening means taking a synergistic approach to thoroughly screening women, based on their individual risk. This requires having a clear understanding of the pros and cons of the available supplemental imaging tools for each individual patient. In addition to 2D mammography, this may include such tools such as ultrasound or 3D automated breast ultrasound (ABUS), digital breast tomosynthesis (DBT), MRI, or others as adjuncts to screening. “I’d like to encourage OB/GYNs to partner with their breast imaging radiologist colleagues to develop a clear course of action for patients based on risk profiles. This may include supplemental screening and, for high-risk women, beginning screening at a younger age. We are in this together to avoid delay in diagnosis and enable patients to make informed choices to create an optimal screening plan based on individual risk,” added Dr Saini. Are you equipped to meet the breast health needs of every woman? Every woman is different and nearly half of women could have elevated risk or complicating factors that may require a personalized approach to screening and diagnosis. Are you prepared to meet their personalized needs? With the GE Breast Health Advantage, you’ll have access to an adaptable portfolio of technologies, insights and services to help you serve the personalized breast health needs of the women in your patient community, including those who may have elevated risks or complicating factors. For women at increased risk of breast cancer, clinical studies have shown that technologies in addition to mammography may contribute to earlier detection, particularly in younger women for whom mammography is less sensitive.13 The American Cancer Society guideline for the early detection of breast cancer, last updated in 2015, stated that women at increased risk of breast cancer might benefit from additional screening strategies beyond those offered to women at average risk, such as earlier initiation of screening, shorter screening intervals, or the addition of screening modalities (such as breast ultrasound or magnetic resonance imaging) other than mammography and physical examination.19,20,21 Factors that should be considered by clinicians include cleared and approved product labeling, recommendations and guidelines provided by medically sourced organizations, and appropriateness when considering how they may apply to your organization or practice. DenseBreast-info.org is an information resource focused on providing breast density information to both patients and health care professionals. The organization is a 501(c)(3) non-profit and accepts no advertising. Its educational mission is supported by unrestricted educational grants and donations. GE, GE monogram are trademarks of General Electric Company. BI-RADS is a trademark of the American College of Radiology. DenseBreast-Info is a trademark of Densebreast-info, Inc. VolparaDensity is a trademark of Volpara Health Technologies Limited. Third party trademarks are the property of their respective owners. Update My Settings | Lippincott Williams & Wilkins | All rights reserved. You received this message because you are a valued LWW/WK Health customer, author, or editor. This email was sent to annette@deptofcreative.com. If you no longer wish to receive these emails you may unsubscribe at any time.